Enoch Sears‘s Businessofarchitecture.com site represents a marvel of marketing effectiveness, both as a website and resource for architects. He has designed this site with all the best practices you can envisage for lead generation and utility — including relevant videos, effective calls to action for additional material, and functional social media tie-ins and resources. You can study this site (I certainly have) as a marketing resource in its own right. But there is more to the site than self-serving marketing: Listen to and view the videos (and read the transcripts if you are in a situation, as I am now, where audio would be distracting), and you’ll learn case study stories and obtain advice on how to effectively build and manage an architectural practice. 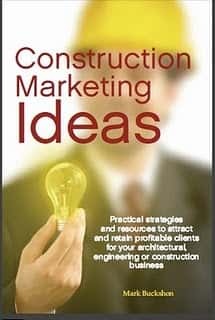 He doesn’t endeavor to provide marketing resources for large corporate architectural practices — but his services/tools are ideal for solo practitioners and small or start-up practices. The goal here is to share information that gives solo architects and boutique firms the ability to leverage the internet and technology for success. I want to empower architects to do what they love – I believe the world is a better place when architects shape the built environment. The web and new technologies offer tools that have enormous potential to magnify individual effort. This is the Business Development 101 for Architects that isn’t offered in school. 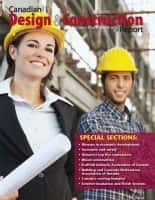 Here we interview architects that have built successful businesses and have them share their secrets. If you’d like to see what kind of content I have on here, start with this video with Oscia Wilson about how she built her architecture firm during the ‘great recession’. Wondering what social media is all about? Want to know the five mistakes architects make when commissioning a web site? Maybe are trying to decide if BIM is right for you. Well, tune in to discuss these topics and more. 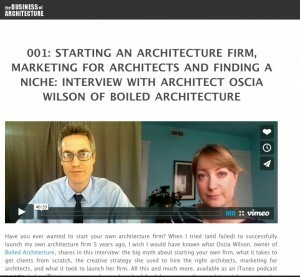 Architect Interview – Oscia Wilson on Business of Architecture Part 1 from Enoch Sears on Vimeo. I think this site is a worthy entry in the Best Construction Blog competition. Voting continues through March 31. You can select one or more of your favourite blogs here.